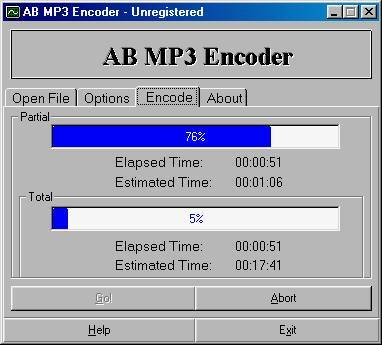 Description: AB MP3 Encoder is a fast application which will encode your WAV files into MP3 files. You can make a waiting list up to 100 different WAV files. Two progress bars will tell you how much has been done and how much has remained. Also, two independent clocks will estimate the time which has remained. It is small (exe file has just 28 Kb) and it has a really nice, friendly GUI. Description: AC3Tools Pro is the complete professional suite for AC3 files processing that enables to decode AC3 files into two-channel MP3, WMA, WAV or Ogg Vorbis files, extract each channel from an original AC3 file into separate files and recompose WAV PCM files into AC3 being sophisticated encoder that offers superior audio performance. AC3Tools Pro supports Dolby Prologic and Dolby Prologic II profiles to maintain full-bandwidth surround sound. Description: Click the mouse and forget about it! No confusing bit rate calculations or rocket science know-how needed! With this extremely useful software you can convert your MP3 files into WAV files for creating custom CD's or for editing in your favorite editor! It will even automatically detect incomplete music downloads! Description: All Audio Converter is a fully integrated Audio software package to make your own digital music and audio CD. It can encode wave to MP3, WMA, VQF, OGG, decode MP3, VQF, OGG to wave file, rip audio CD tracks to wave and mp3 files. Use MP3, wave files to burn your own audio CD. All Audio Converter was designed to be easy to understand and use. Yet, it is a powerful and complete audio music software package available. Description: Allok Audio Converter is a powerful tool to convert audio formats between MP3, WMA, OGG, MP2, WAV( PCM, DSP, GSM, ADPCM ), G721, G723, G726, ALAW, ULAW, VOX. The very user-firenldy and easy-to-use interface lets you easily convert audio files in batch regardless of their source formats and target formats. Allok Audio Converter also supports playback with its built-in player. Description: An audio software built in recording, editing and coverting sounds to MP3, WAV, OGG popular music format file. Typically it allows you to record sound from various input sources, edit audio files as you desired by cutting, copying, pasting, trimming and various DSP effects, save audio in popular WAV/MP3/OGG music formats. The program also supports voice activation and silence detection, track spliter smart and schedule features. Description: Audio Converter and Ripper is an audio converter utility to convert or fast batch convert audio files from/to MP3 (including VBR), WMA, WAV, ADPCM, GSM, DSP, MP2, PCM, OGG Vorbis, G721, G723, G726, A-LAW, U-LAW and RAW. Automation via scripting is also supported. Audio Converter and Ripper includes: Audio player, CD ripper, Audio tag editor and Audio converter and automation via scripting. 30-day unconditional money-back guarantee. Description: Audio Converter Pro can convert audio files between CDA, MP3, WAV, WMA, OGG music formats. Main Features: - 20 converters in one - Fast converting speed. - Batches conversion. - Format settings. - Source deleting. - Skins suppor. - Playlists support. - Tag editor. - Drag and Drop.